The owners and operators of specialist tankers have a unique conference focused on the regulatory and commercial issues impacting the sector. Run since 2008 in close collaboration with the International Parcel Tankers Association, the Chemical & Product Tanker Conference has been developed with the needs of senior management from shipping companies at the front of mind. Over two days, professionals from across the industry will share their expertise on a variety of topics including: Reducing green house gas emissions: what strategies will the industry need to take? Global Sulphur Cap 2020: commercial decisions Tanker freight markets: the outlook Tank cleaning and pre-washing: regulatory update Insurance, vetting and spill response Security The conference is structured around presentations and panel discussions, with plenty of networking opportunities. Confirmed speakers include: Jasper Faber, Aviation & Maritime Specialist, CE Delft; Mark Cameron, COO, Ardmore Shipping; Joachim Lund, CCO, Thun Tankers/Gothia Tanker Alliance; Henry Curra, Head of Research, ACM-Braemar; Lance Nunez, Bulk Marine Operations, DOW Chemical; Kjeld Aabo, Director of New Technology, MAN Energy Solutions; Manish Jain, Director Operations, Womar Logistics with more to be announced. 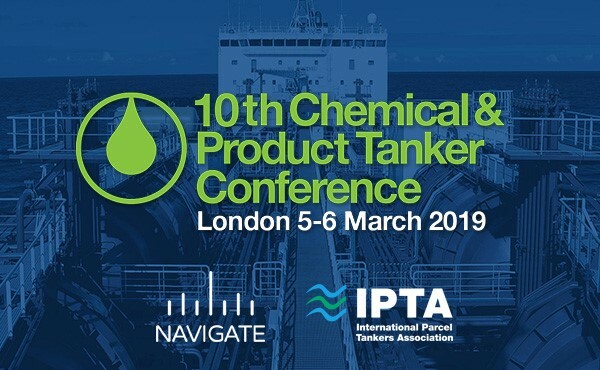 The IPTA/Navigate Chemical & Product Tanker conference is now firmly established as the “must attend” global event for all those with an interest in this sector. Now in its tenth year, this event attracts owners and operators of the world’s fleet of chemical and product carrying tankers as well as shipbrokers, charterers, lawyers, insurers, regulators and equipment manufacturers from around the world. An intensive two days of learning, debate and discussion is punctuated with plenty of opportunity to meet and network with your industry peers over coffee, lunch or evening drinks. As ever, the conference agenda comprises a topical mix of commercial, practical and regulatory issues. Top quality speakers representing some of the sector’s best known companies and organisations have been invited to share their expertise and knowledge. The Chemical and Product Tanker conference is staged jointly by IPTA and Navigate.